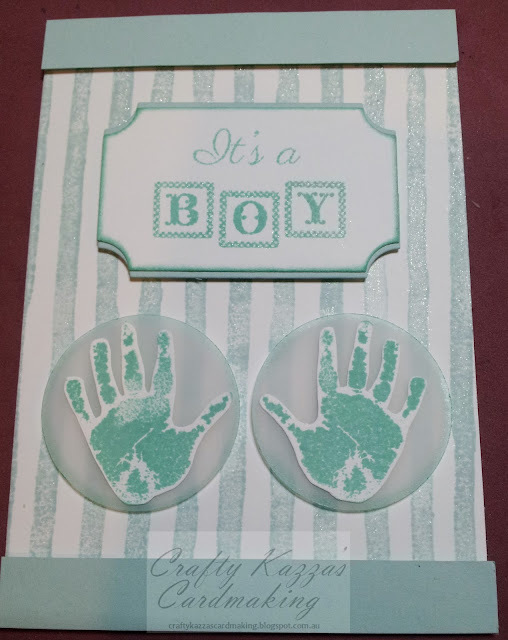 Crafty Kazza's Cardmaking: Hey Baby Baby! Hi there everyone, I hope you're all having a brilliant day! Today I'm here to share with you a baby card I made last night! I haven't generally made that many baby cards so this is me attempting to branch out a bit. Now I've been a very lucky vegemite (aussie slang) and Mr Taxman has been showering me with crafty goodness :o) <---- that right there is a big giant grin lol... So on the weekend, I took a very out-of-the-ordinary-trip (for me) up the Toowoomba Range and visited Spotlight and Kaisercraft. 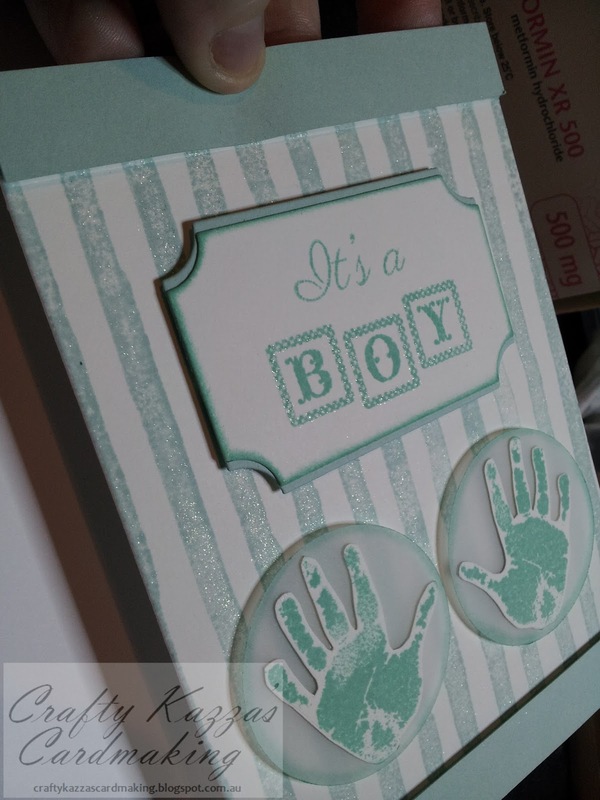 Spotlight has a lot less in the way of cardmaking stock than I was expecting. Although, I did buy a few dies, papers and embossing folders. Next on my crafty junket was Kaisercraft. I discovered the Kaisercraft brand dies are cheaper at Kaisercraft than at Spotlight, however one stencil cost $1 more at Kaisercraft for the same small 6x6 stencil, than at Spotlight. Kaisercraft kept me occupied for ages, I took the time and checked out EVERYTHING, and bought some more dies, embossing folders and papers. Additionally, yesterday Mr Taxman brought me some StampinUp lovliness! Inks! Stamps and cardstock <3. This card, made last night, uses one of the stamp sets I bought at Kaisercraft and some of my StampinUp goodies. Kaisercraft: Pitter Patter and Decorative Die - Die Cut Shapes. StampinUp: Brushstrokes, Pool Party, Soft Sky and Coastal Cabana^ Inks, as well as Pool Party, Whisper White and Vellum Cardstocks. I love how it turned out, I hope you do too! Stay tuned for some more crafty creations coming soon. Thanks for stopping by and commenting when you get the chance, I do appreciate it! Gorgeous card, Karen! I have the Pitter Patter set too, and use it a lot!! Thanks Cheryl, I'm glad I added that set to my stash, I think it will be used a lot by me too!